As the first snow flurries begin to fall, I rush to put out extra seed in my yard. 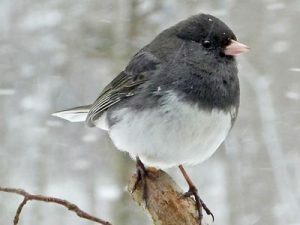 Within seconds, a junco appears beneath the feeders, as if beamed in from Canada. Mind you, I had not seen one of these “snow birds,” a small charcoal and white bird the size of a sparrow, — with white tail stripes that flash when it flies — since a brief cold snap in early November. Then my single Canadian immigrant disappeared, or simply went into hiding. Nearly a foot of snow has accumulated here in Bethesda, as measured by the deep piles on outdoor tables, birdbaths, small walls in my garden, and the top of my Prius. It will need to be shoveled off — after I locate long-buried scrapers and shovels somewhere deep in my garage. But for now, I marvel at the silence and serenity of winter. 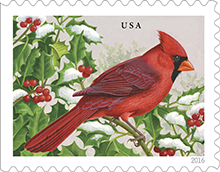 A male cardinal lands in my holly tree. The berries suddenly seem a deep, bright red, standing out in bunches against the dark green holly leaves holding small clumps of pure white snow. 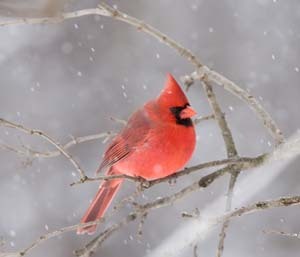 My crimson, crested cardinal sits stunningly amidst this splendor, posing for artists whose images have appeared on calendars, plates, snow globes, and stamps — wherever a symbol of the beauties of winter has been needed. Juncos and cardinals are joined now by other small birds who stand out against the dazzling snow. Chickadees and titmice flit in and out of the sunflower feeders; they grab single seeds to be pounded and opened on some nearby, snowy branch. White-breasted Nuthatches arrive upside down along a trunk or brick wall; they also pick out a single seed. But they usually fly out of view before they stop to eat. 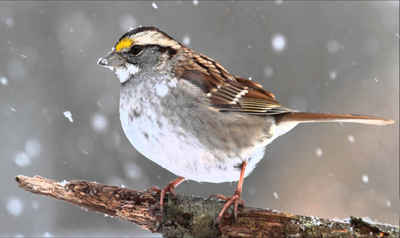 On the ground, White-throated Sparrows and Song Sparrows jump slightly backwards in the snow as they dig for seeds quickly being covered up. A chestnut and tawny, curved-beaked Carolina Wren and a black and white Downy Woodpecker take turns pecking and probing at my suet feeder. House Finches, the males splashed with brilliant red, push each other and scuffle to get some unknown advantage at my feeders. Mourning Doves walk about below and peck patiently at the cracked corn scattered on the snow. Blue Jays and a Red-bellied Woodpecker sail in to gobble peanuts. I wonder why I am so taken by this scene and the sudden, overdue arrival of real winter. I venture out to find my neighbors guiding their two-year old carefully through the snow. She stumbles, giggles and, with her mittens, touches the mysterious white stuff as her parents snap pictures of her first real snowfall. Elsewhere, there are the beginnings of snowmen, the happy sounds of kids sledding down the barest of inclines on their lawn. 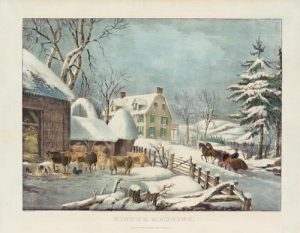 Currier & Ives “Winter Morning” has come to Bethesda. I realize that I have been somehow longing for this new season, for a fresh start, for snow. Rachel Carson took solace in the changing of the seasons. “There is something infinitely healing in the repeated refrains of nature – the assurance that dawn comes after night, and spring after winter.” Carson was aware of the earliest studies of global climate change, but she could not have known that average temperatures in Maryland, where she lived and worked on Silent Spring, have risen about 2̊ F since she was born, that sea level in Baltimore, where she went to graduate school and first worked, has risen by a foot. Winter temperatures in Maryland, according to a 2015 study by The Climate System Research Center at UMass-Amherst, have regularly been higher than our historic 53° F average for over 25 years. The CSRC puts it bluntly, citing data from the U.S. Geological Survey, “The coldest winters in future will be like the warmest of recent years.” Or, as they put it another way about winter in Maryland, “there will be more rain and less snow.” To be clear, the report indicates that rain will not only steadily increase, but it will come in more frequent heavy bursts leading to flooding. 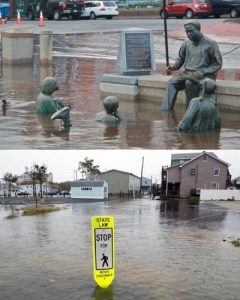 Here in Maryland, I had already forgotten about the abnormal floods in Annapolis (2012), Ellicott City (2016 and 2018), and Ocean City (2015). Pictures in the Maryland report remind me. I can recall, of course, that 2018 brought us record rain and flooding in Houston, Texas and in Wilmington, North Carolina where, even without the rains from Hurricane Florence, this year’s rainfall was the second highest in history. But Maryland never seems to make it into national news. Who cares if winter snows and shoveling and sleds are disappearing? I begin to understand my joy at the return of a real winter snowstorm and scenes that were common in my youth and in American lore. But I can feel, too, my fear and anger that scenes of toddlers wallowing in snow above their boot tops, or bigger kids making snow angels, are now fleeting, evanescent, soon, perhaps, to be gone forever. There have been 122 days of rain this year in Bethesda. We passed the annual rainfall record set in 1889 just before year-end. Like most Washingtonians, I nattered at the long string of doleful, dreary days. But they seemed appropriate backdrop to our fascination and horror at the increasing recklessness of the Trump Administration. I noted, too, that my camellias were in bloom, that azalea blossoms opened here and there, that lawns were oddly green, or simply muddy. I know now the consequences of our unending rainy season, our extended summer, and sodden fall. Reality sets in. I vow again to fight for policies to slow or stop these trends, to restore the Bay, to somehow get a Green New Deal. But what I am feeling goes much, much deeper. 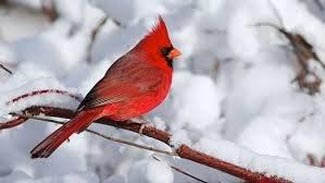 Who will put a price, not on carbon or pollution, but on my lost winters, on the end of scenes from my childhood, on our vanishing history of snow and sleds and sleighs, on a chickadee hanging from a snow-capped branch, or on a plain red cardinal posing proudly as a symbol of the beauties of the winter?